Open to all tunethusiasts, any genre. Have a favourite tune that no one in the session knows (yet)? Want to impart your tin whistle wisdom? What ‘s your secret to backing tunes? Sign yourself up as a ‘sharer,’ check the blackboard/FB as a ‘sharee’, or just turn up and help expand the ‘tuniverse’. Uke jam curious? Bring your uke and a smile and surf the ukulele wave with us. Jam leaders will paddle the musical canoe with you. Words/tabs provided. All instruments welcome! Cath Ovenden and colleagues have been playing these pure old Australian dance tunes for decades. Come along and learn tunes passed on from Joe Yates and others. 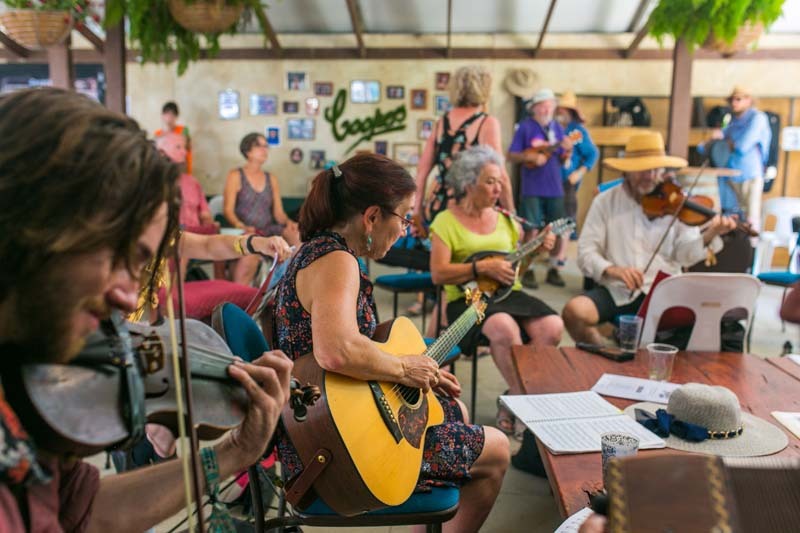 Mazurkas, polkas, waltzes, jigs and reels from our own Australian backyard. Sheet music available. Bring your instruments or sing along to some ‘high lonesome’ standards from the great Bluegrass repertoire. Scottish ‘tunes’ played by ear with Emma. Traditional reels, jigs, strathspeys - Music with the scent of heather. Join the ‘Craic’! Trad Irish tunes played by ear - jigs, reels, hornpipes. Play along if you know the tunes. Or tap, clap, dance! How do they know what to play next? Come join in with the songs sessions. Bring along your voice, your instrument, your friends and all of your energy for open sessions of acoustic songs with a few tunes thrown in for fun. Everyone is welcome to join in. Slow to intermediate - learn and play trad Irish ‘tunes’ by ear. Yes, you can! Traditional English dance & Morris tunes - Come play music that makes you want to hop, skip, and jump. Bring your banjos, fiddles, guitars and mandolins for some great play-along American fiddle tunes. Sing along to those Old Time songs that have stood the test of time, with familiar choruses that you didn't realise were rattling around in the back of your brain.